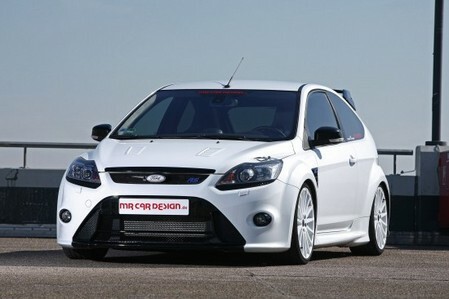 Even though this version of Ford Focus has been replaced with the 2012 model those who want the hotted-up RS model have to wait another year or so to get it. Or, they can get an old RS, which is still a pretty good car, and have it tuned to make it even more interesting. Check out this one by MR Car Design as a good sample. First off the tuner has boosted the power of the 2.5 liter five-cylinder turbo engine up to 360 hp, 55 more than the standard, using sport exhaust system featuring 200-cell catalytic converter, ECU remapping, and K&N air filters.It now does zero to 100 km/h in 5.9 seconds. Then to cope with the extra performance the they’ve provided it with KW coilover suspension Variant 1 and bigger brakes. For that little extra something the car also gets some visual tweaks.